FMFQ-4~6×2 Pneumatic Flour Mills is our new developed medium flour milling machines. It adopts double arc flank profile belt. 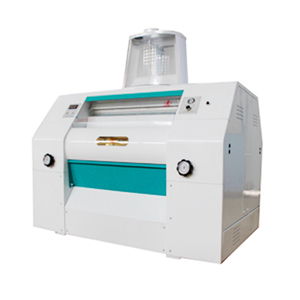 The series flour milling machine features balance transmission, low noise, no oil dirty, unique roll bearings equiped. Compared to normal roller mills, it is reliable in orientation, stable in working. Moreover, the flour milling machine is sensitive and exact when change the clutch gate of roller mills. It can controlled both by hand or pneumatic, which is very convenient in operation. The series flour milling machine use induced receiver for raw materail, with smaller resistance and convenient discharge of material. 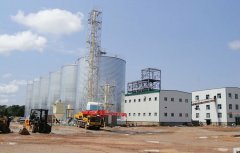 With motor inside, compact structure, the FMFQ series flour roller mills are completely closed in whole, thus the operation is very safe and reliable. 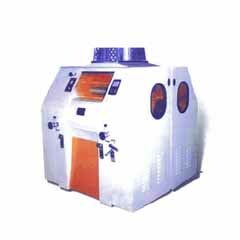 The FMFQ series Flour Milling Machine is one of mulriple type oblique pneumatic flour millinging machines. 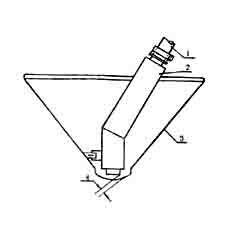 It have similar working theory as the MDDK flour mills. 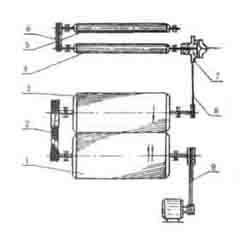 The rollers are oblique, featured adjustment of roll clearence and transmission etc. structure. 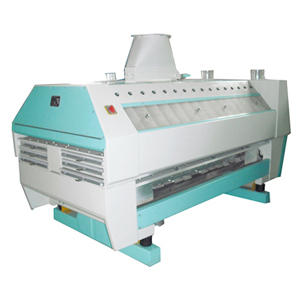 FMFQ flour milling machine has similar feeder as MDDK. The different is that the open or close of movable gate for feeding is directly drived by swivel arm moved by sense float. Every pair of rollers adopt two pieces of double ar flank profile timing belt. 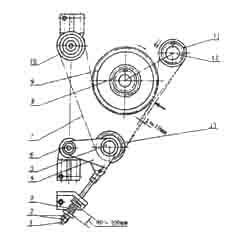 When equipping, the sign of two belt should be kept on one line and the belt should be tighten by drag link nut for adjustment of tensioner pulley. 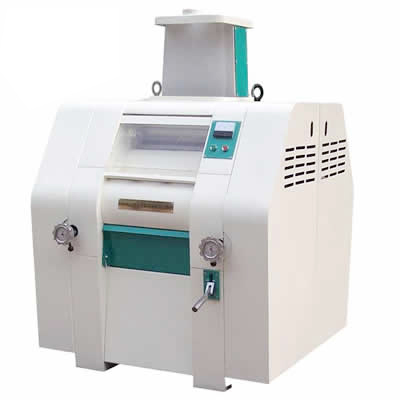 Whether the belt is tighten affect the flour grinding machine greatly. The degree of tightening is tested by tensioner test device. 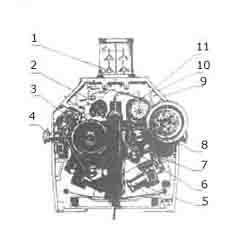 When the valve closed, the belt should be pressed as Fig.F4-4. When load is 6.6kgf, the suitable displacement X=10mm. At this time, the length of spring is about 90~100mm. Timing belt can not be tighten too much, or it will make bearings damage prematurely. The external roller of feeding roller is driven by slow roller, so the speed of feeding roller relates with diameter of driven belt pulley of feeding roller, rotary speed of fast roller and speed ratio of slow roller and fast roller. 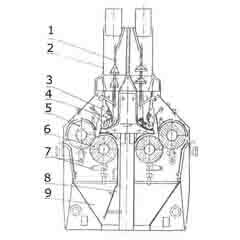 The structure of roll clearance adjustment device of FMFQ flour Milling Machines pls note Fig. F4-5. 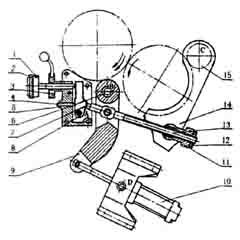 It use Multi-lever rod, direct driven by air cylinder to move bearing arm of slow roller to realize blutch valve. Thereinto, the supporting point of top riser frame is A, the supporting point of adjust arm is B, the supporting point of bearing arm of slow roller is C, and the supporting point of air cylinder is D.
When push rollers, air cylinder close to fast roller by screw shaft dragging bearing arm of slow roll. The position of slow roller is limited by top riser frame which the position can be adjusted of screw shaft. When roller moves back, the screw shaft leave off top riser frame. During working process, adjust the handwheel to eject the top riser frame, which can press the piston of air cylinder retraction and increase the roller clearance sequentially. Contrarily, the roller clearance decrease. 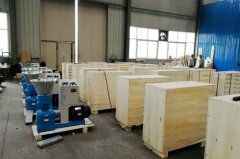 When hard material come into grinding room, the piston of air cylinder will be ejected because of increased pressure, which can protect the flour grinding machine. Under the top riser frame, there is a limit adjusting nut equipped to protect rollers from knocking in working process. 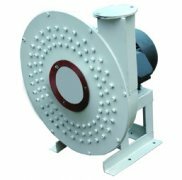 The discharge way of the roller mills have two kinds: one is auto flow discharge, the other one is adsorbing material by grinding room. 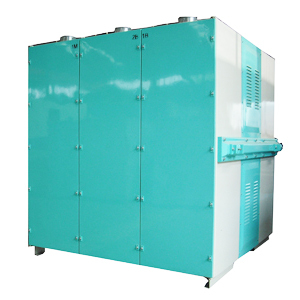 The adsorption material of grinding room pls note the following Fig.F4-6.